Of the $1.7 billion that the Bill & Melinda Gates Foundation has pledged to public education over the next five years, the majority will go toward supporting innovations within schools that have joined together in collaborative networks. Philanthropist Bill Gates made the announcement in Cleveland Thursday afternoon during his keynote speech at the Council of the Great City Schools’ 61st annual conference. Gates hopes that the flexibility network schools have to drive “durable” and “impactful” change will make them incubators for best practices other schools can eventually adopt. This latest investment marks a slight shift in the foundation’s direction. In the past, it has invested in small high schools, teacher evaluations tied to student test scores, and support for the Common Core standards, but those investments weren’t driving the scale of change hoped for, Gates said. In addition to cultivating data-driven, evidence-based innovations in network schools, the foundation will support curriculum development, professional development, and charter schools, especially in their work serving special education students. Gates listed many examples from across the U.S. of the types of innovation the foundation will seek to identify and support: Fresno’s work boosting the number of students applying for college by using data to create college-option packages for high schoolers who meet college requirements; Summit Public Schools’ work to identify best teaching practices among its staff to boost achievement for English language learners; LIFT Tennessee’s collaboration of superintendents to share innovation across the state; and Chicago’s Network for College Success, which looks to boost college-attendance rates with a specific focus on ninth-grade students. 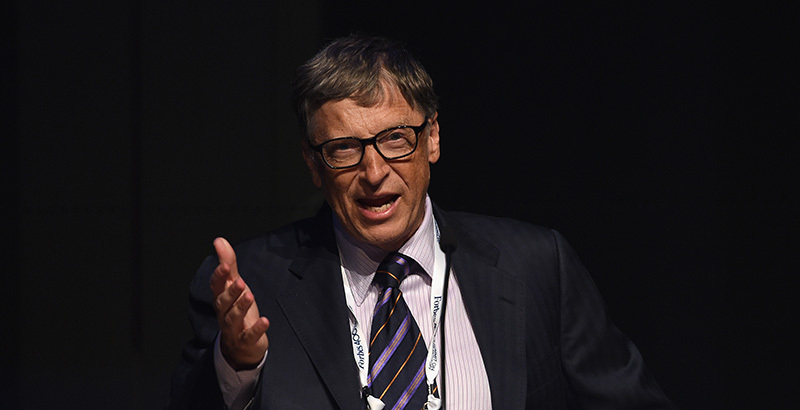 “Big bets” in innovation will receive 25 percent of funding, Gates said. He cited education research as one of the most underfunded of any subject area. Advancements like artificial intelligence should be expanded throughout a school day to make learning fun, Gates said. Math will also be an area of focus, Gates added, as the foundation searches for evidence-based solutions for teaching and boosting student achievement. Fifteen percent of the foundation’s funding will go toward expanding charter schools nationwide and specifically in Washington state, where 10 charter schools operate amid a years-long lawsuit threatening their constitutionality. The foundation also wants to support how charter schools serve special needs students. As co-founder of Microsoft, Gates is worth an estimated $89.8 billion, a fortune he and his wife, Melinda Gates, have used to spur change around the globe in health care and education. Created in 2000, the Bill & Melinda Gates Foundation headquarters is in Washington state. The full video of Gates’s remarks to the Council of Great City Schools, a group of 68 of the country’s largest urban school districts, will eventually be available for viewing on the 90.3 WCPN ideastream Facebook page. Disclosure: The 74 receives funding from the Bill & Melinda Gates Foundation.